It’s June and this means the time to turn on your grill! Have you ever tried to prepare a clean eating BBQ party? It’s easier than you think! I put together a menu of my favorite summer BBQ dinner recipes that don’t include over-sized hamburger buns and enormous amounts of meat (and no, barbeque dinner is not a meat grilling fest). 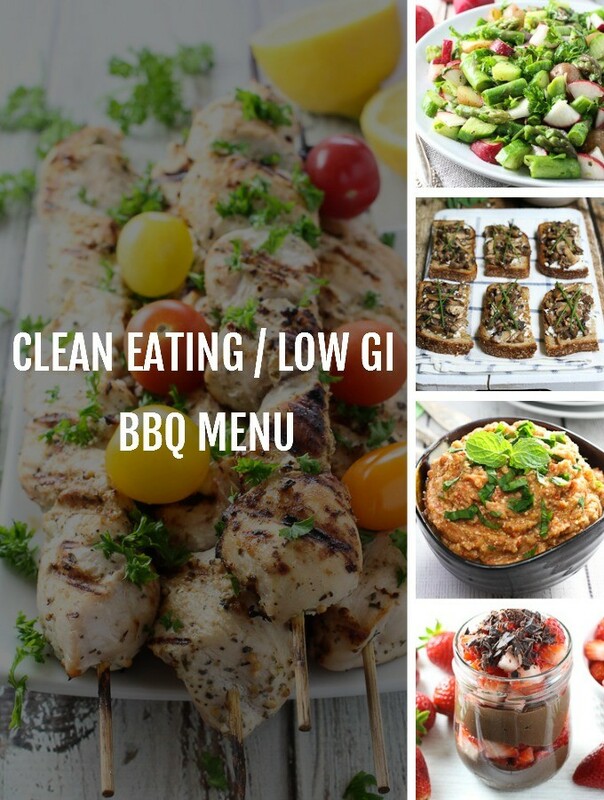 This clean eating BBQ menu includes two appetizers, two salads, a main dish, a side dish and a dessert. All the recipes are found here on the blog (just click on the links to view the recipes) and are very easy to prepare. I think this menu should be enough for 4 to 5 people. 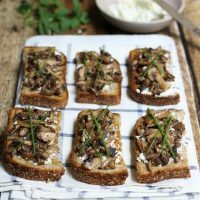 These Goat Cheese and Mushroom Crostini are a great starter to your dinner party. They are very easy to make. You can prepare the mushrooms in advance and keep them in the fridge. Just make sure to warm up the mushrooms before serving because the crostini taste better when they are slightly warm. 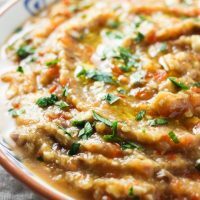 This Roasted Eggplant and Feta Dip is another great appetizer that is perfect for a barbeque party. 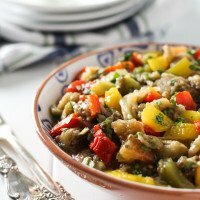 I roasted the vegetables in the oven for this recipe because I posted it in January and didn’t feel like going outside to grill the veggies. During summer, I would grill the veggies on a BBQ. This dip tastes best served with some healthy crackers or veggies. 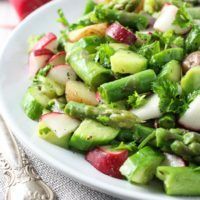 This Potato Salad with Asparagus is a great clean eating alternative to the traditional potato salad. It’s full of wonderful seasonal veggies and really easy to prepare. This salad keeps really well in the fridge so you can prepare it a day ahead. I think it almost tastes better the next day because the veggies marinate a bit and the flavors blend in a really nice way. Another salad that’s great for a summer BBQ dinner is this Summer Salad with Feta Cheese. 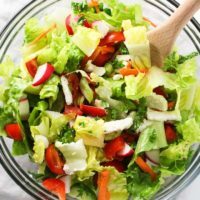 This salad is also very easy to make and super healthy. If you decide to prepare this salad in advance, do not mix it with the dressing. Keep the salad and the dressing separate in the fridge and mix just before serving. 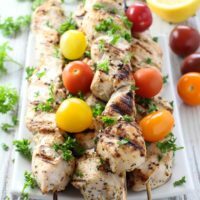 These Yogurt Marinated Chicken Kebabs are perfect for a clean eating barbeque dinner party. You can marinate them in the morning and quickly put on the grill after the guests arrive. They take about 20 to 25 minutes to cook. As a side dish, we always grill veggies. Our favorites are bell peppers, tomatoes and Chinese eggplants (these are the long and thin eggplants; they cook much faster and are not bitter). We grill these veggies whole without cutting them and then just pull off the skin and add some salt and pepper. They taste great and are super healthy. In addition, they don’t require any prep work. Seasonal fruits and berries make the best dessert for summer BBQ parties. If you want to serve something extra, check out this Chocolate Pudding. I prepared it with strawberries, but it will also taste great with other berries or it can also be served as a dip with cut-up fruit.